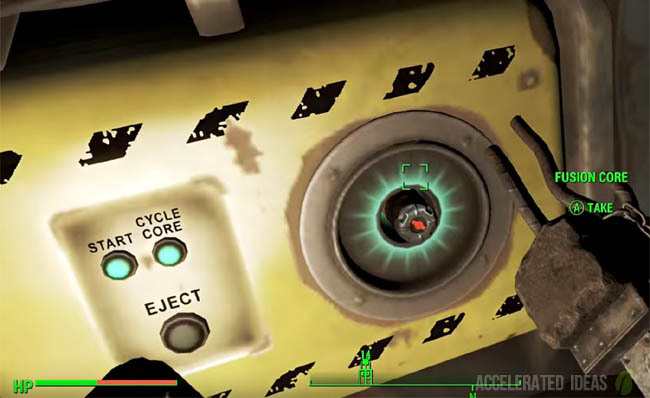 As we anticipated, someone has leaked the entire Fallout 4 map from the Pip-Boy. This is the first reveal of the official in-game map, giving us a chance to compare the size with other Bethesda games such as Skyrim and previous Fallout titles. Reddit has gone absolutely crazy the last couple of days, with a shed load of leaks from all directions. First we had the complete perks list (which I've updated on this site) but just today we saw the entire map leaked online. The image below shows the stitched together map from Fallout 4. This was achieved by piecing together each of the video frames and making one complete image. It's a little fuzzy but that's typical PipBoy for you. We don't know for sure what zoom level the leaker was using but a good guess is that he/she maxed out to top level. That's probably in our favour, allowing us to compare the map with other titles. 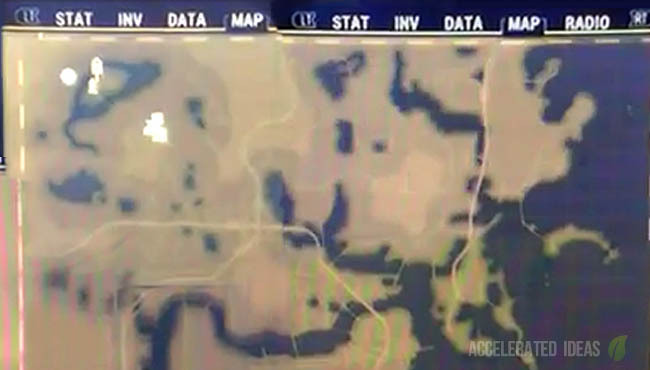 Take a look at the image above which shows the leaked map together with other Fallout fall map sizes overlayed on top. The green square is the size of Fallout 3, whilst the red area is that of New Vegas. 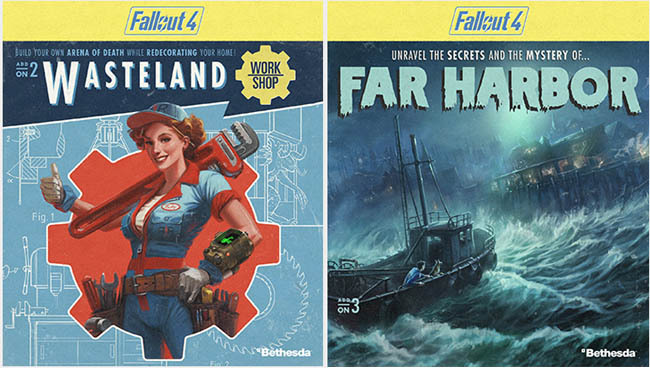 In both cases you can see the Fallout 4 world is far bigger. This of course is based on the assumption that grid sizes are comparable between games. 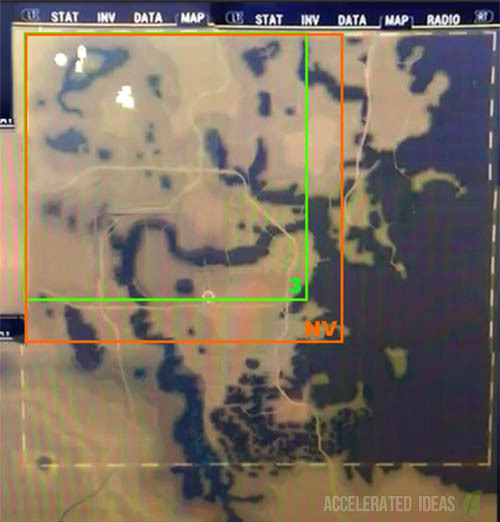 FO4 has a grid system of 28x28 (based on the leaked image), whilst FO3 had 17x17 and New Vegas was slightly bigger with 19x19. Is it bigger than Skyrim? Players that have an early copy of FO4 have compared the map size to that of Skyrim, minus the mountains of course. They also stated that the map is NOT bigger than Skyrim and New Vegas combined, as previously stated by Bethesda. However, that doesn't mean that verticality and density levels will be same - we expect the opposite in fact with far more features crammed into the city areas in FO4. Comparing the FO4 map to previous titles is also a little misleading, especially when comparing to Skyrim. Skyrim only scratched the surface in verticality terms, yes there were underground areas and huge mountainous regions but FO4 goes far deeper - literally. We've got vaults, towers, city buildings etc. There are lifts, shafts and tunnels which add another layer to the map size so although 28x28 sounds a lot it could be more like 28x28x2 when you add in the vertical aspect to the equation. Take another look at the leaked map image again. Notice that huge chunk of water to the East and also those rivers dissecting the landscape? Some people would write that off as unexplorable - in a way that would be partly true. The sea may or may not be explorable but the rivers certainly will be. We already know of the Aquaboy perk which helps you breath underwater for longer. Expect to see many hidden areas and secrets to find below the surface as well as on land. The artwork of Fallout 4 has already revealed many aspects of underwater exploration. There has been speculation on underwater aspects including diving with Power Armour, Squid monster attacks and even underwater UFO's. True, these have been speculative but there's certainly a whole new world to explore under the water if the artwork is anything to go off.